phpDesigner for Windows 10 - a tool for creating web pages with the possibility of visual debugging. 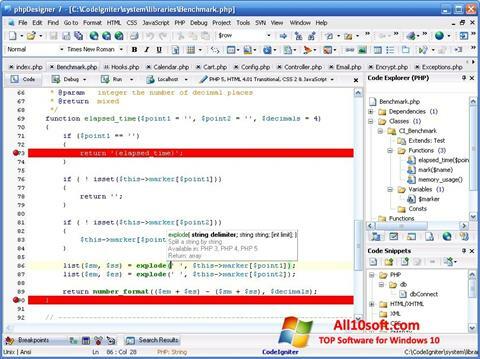 The program supports syntax highlighting and auto-completion of most web languages, includes tools for optimizing html markup, analyzing and profiling scripts, with the ability to review variables and quickly switch to code declarations. It contains a command reference and SQL query designer, uses Xdebug for step-by-step debugging, previewing the involved operators. It can connect jQuery, Dojo, Prototype libraries, check the correctness of the input, work with ready-made blocks and code generators. You can free download phpDesigner official latest version for Windows 10 in English.